Specialist industrial cleaning often involves contact with substances which are classified as hazardous under the Control of Substances Hazardous to Health Regulations. Typical examples include chemicals such as silica dust or mercury and anthrax spores in old horse hair plaster. BES has access to laboratory testing services to identify the presence of such substances and our technical capabilities mean that full COSHH assessments are prepared before cleaning plans are formulated. 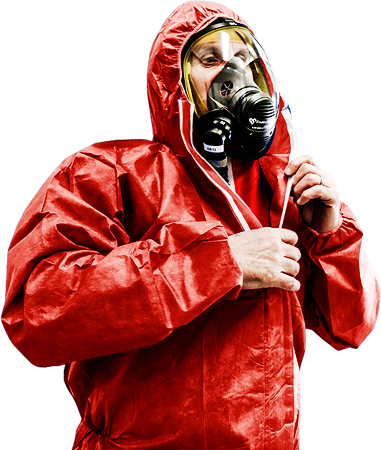 In appropriate circumstances personal and environmental air testing is undertaken to confirm the adequacy of all of our containment precautions. Upon completion freedom from residual contamination can be certified with testing by independent consultant laboratories. Labelling, transportation and disposal of resultant wastes and debris must be in compliance with environmental legislation and Environment Agency requirements. BES is a Registered Waste Carrier and we provide a fully documented audit trail to our clients upon completion. Industrial cleaning necessitates highly skilled operatives. BES ensures that our operatives are trained to the highest standards. This includes training in the use of personal protective equipment, decontamination procedures, confined space entry, high level access, chemical use and disposal of wastes. BES can provide complete contract management and arrange for site investigations to accurately quantify the nature and extent of any contamination. Alternatively we can provide a list of suitably qualified and experienced organisations. Specialist industrial cleaning requires careful planning and our free survey is the first step to determining the most efficient and safe way forward. Our senior management is always pleased to discuss our services and how we may be able to assist you and your company. Please do not hesitate to contact us without obligation.